Type: Herringbone. There are many reasons this is a personal favorite of millions. The first reason is the beauty of gold. The third reason is often overlooked however it is equally as important to many people as the other two. 18k Yellow Gold Braided Weave Herringbone Link Chain Necklace Italy 20"
Markings: "18kt" "Italy" "MBC". Country of Manufacture: Italy. Closure: Lobster Claw. 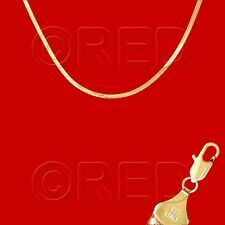 Ending Apr 28 at 5:02PM PDT4d 1hMetal: Yellow GoldStyle: ChainLength: 20 - 21.99"
6 MM HERRINGBONE NECKLACE. NEW 10K YELLOW GOLD. MAIN COLOR : YELLOW. (not plated or gold filled). Prices do fluctuate daily based on market and other factors. 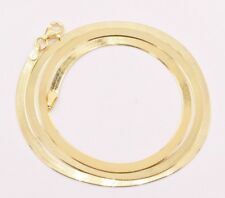 authentic gold and diamond product at a market's lowest price. 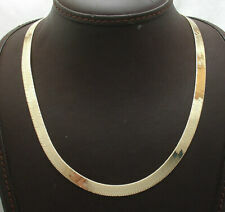 Aurafin 18” 14K Gold Flexible Flat HERRINGBONE Necklace Italy. See markings on clasp. 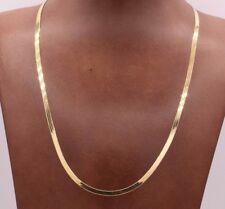 Metal: Yellow GoldFeatures: Lobster ClaspLength: 18 - 19.99"
Fine 10K Yellow Gold 3.0 mm Herringbone Chain Necklace Size 16"-20"
Ending Friday at 7:29PM PDT2d 3hMetal: Yellow GoldStyle: ChainLength: 16 - 17.99"
14kt Yellow Gold Herringbone Chain Necklace. Price is forone chain only. 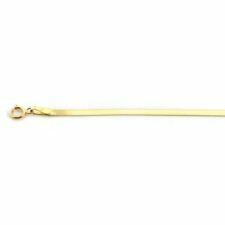 Mens Womens 10k Real Yellow Gold 3mm Herringbone Chain Necklace 16" - 30"
18k Yellow Gold Herringbone Necklace. 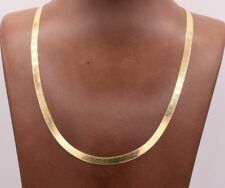 · 18.5” x 2mm marked “18k Italy”. 18.5” x 2mm 4.2 Grams . 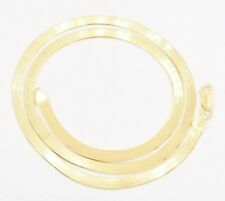 · Clasp marked 18k. · Weight: 4.2 grams. 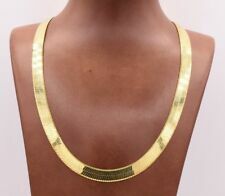 We present to you a Signed Italy 18K Yellow Gold Plated Sterling Silver Reversible Herringbone Necklace 22"! This beautiful piece is sure to receive many compliments! Length: 22 Inch(es) Width: 1 mm Weight: 3.3 Grams Hallmarked: 925 "ITALY" Signed We gladly combine shipping! Everything is packed with care to make sure it arrives safely. We hunt the globe for wonderful treasures that we can present to you! We only sell authentic items. If it is a name brand item we guarantee it to be authentic. If it is made of precious metal and or gems, we guarantee it to be as described. Please check our feedback and buy with confidence. We work very hard to make sure you are happy doing business with us, and we appreciate your positive feedback very much! We offer hassle free 30 day returns, and we pay the return shipping. Heres my imported Italian herringbone chain thats one of the best quality made. 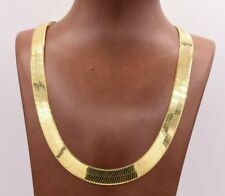 Herringbone chain is made up multiple rows of V shaped links that lie entirely flat giving it a fluid quality when worn. 14K Yellow Gold plated Necklace Chain 7mm Herringbone 24"
14KT Gold Women's Herringbone Necklace 16" 2mm Italy - New SIB Free Shipping!! 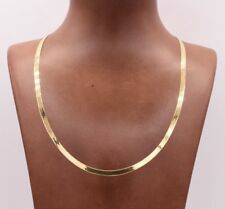 Made in Italy, a 14kt Yellow Gold necklace that has never been worn. Still pristine shiny and in it's original box from Kay Jewelers.